Welcome - here are all the details about HD Chord Camp and the new HD Arranging and Performing Camps. I hope you can join us. If you have any questions about any of the information here (or not here) please email Jon Weinberg. Updated: 4/19/2019 - visits to this page. "My playing has gotten much better since I've been throwing chords into the mix in the right way. A few comments from critics tell the story. My wife says: Your playing is more comfortable and confident now. They have the right rhythms and inflections. A fellow Golden Gate Dulcimer Club member said: I really like the way you play the chords through a song. It really sounds like a dulcimer should. Chord Camp is an intensive week-long series of workshops of learning and playing in a small-group environment, with hammered dulcimer and guitar teacher and performer Jon Weinberg. Jon makes no assumption that you know anything about chords. At Chord Camp the emphasis is on practical application, not theory - you will learn what makes a chord, how to easily play them on the dulcimer, how to use them to back up other instruments (and choral groups), and how to incorporate chords to make solo arrangements of your favorite tunes. We will practice these things together and you will be given some personal exercise assignments to work on, so that you will leave with more than just an intellectual understanding: you will take home tunes and arrangements you have worked on, can modify, and can add to your own repertoire, all of which demonstrate the techniques we'll cover. 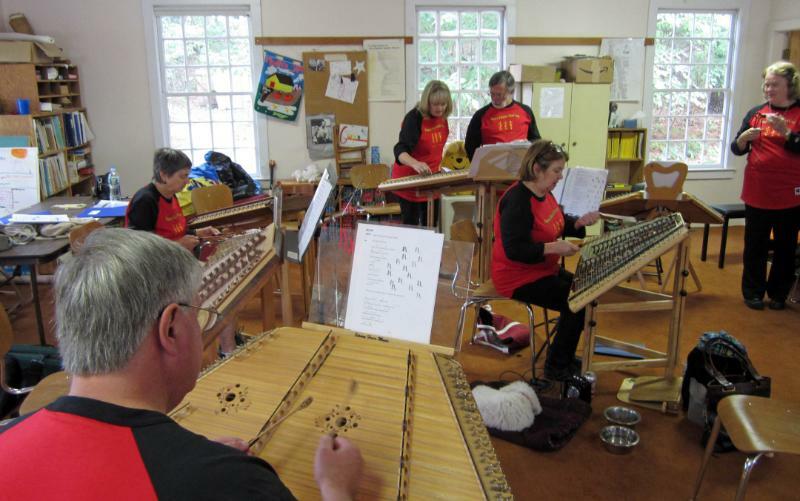 Many other HD chording workshops focus on every which way to play the same chord on a dulcimer and then leave you to your own devices to figure out how that can be useful, or how it fits within common chord progressions. At Chord Camp you'll learn which chords commonly appear together, and how to play triad patterns for these progressions that are easy-to-play and easy-to-remember. Then you'll learn how these chord patterns and playing variations can be applied to most anything you might want to do on the dulcimer, making your musical life more varied and pleasurable and your dulcimer toolkit more robust. Most dulcimer players learn to play by playing melodies without much attention to chords. We will focus on the chords and work our way back to the melodies for a more holistic approach to both ensemble accompaniment and solo arranging. For many dulcimer players this way of thinking and playing can be a real eye-opener. To foster accelerated learning and to provide personal attention class size is limited to only 10 attendees. Once a session is filled we will maintain a waiting list should anyone need to cancel. The spring session of Chord Camp is held at Jerry Read Smith's spectacular Perelandra studio and performance center on the east side of Asheville, NC, in the hills near the Blue Ridge Parkway. 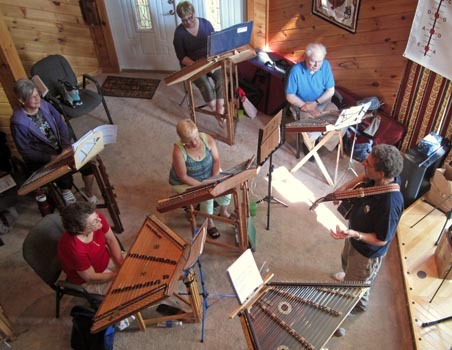 It is one of the weekly sessions offered as part of Jerry's Hammered Dulcimer Academy at Perelandra. Lodging is at a nearby motel 10-15 minutes from Perelandra. Depending upon the number of attendees daily workshops are held either at Jon's house or a nearby meeting space. Lodging is at a local B&B or hotel near Jon's house..
Jon has been playing the acoustic guitar since 1967 and hammered dulcimer since 1990. 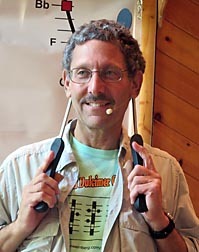 He is a frequent teacher and performer at dulcimer festivals in the northeast US including the Cranberry Dulcimer Gathering, the Nutmeg Dulcimer Festival, the Pocono Dulcimer Festival in Pennsylvania, and beyond the northeast including the ODPC Funfest in Evart, MI. 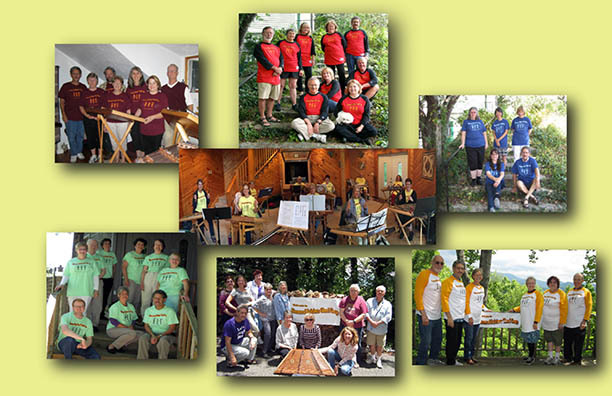 For many years Jon was the hammered dulcimer coordinator of the CCCAE Spring Dulcimer festival in Cambridge, Mass. Jon plays dulcimer at weddings, church services, and other celebratory events, and performs concerts at coffeehouses, town events, restaurants, and at residential assisted living and nursing home facilities. He has accompanied the New England Children's Choir at the New England Conservatory of Music and at Boston Symphony Hall, performed at Boston Revels RiverSing, is a featured speaker and performer on the hammered dulcimer at the Boston Museum of Fine Arts, and is a frequent performer at NEFFA (the New England Folk Festival). As a member of multiple contra dance bands over the years Jon developed a system of dulcimer chords and a backup playing style that he teaches both to private students and at dulcimer festival workshops. He is currently an active member of the New England band Wild Card. Jon teaches private hammered dulcimer lessons at his home in Marlborough, Mass. and online via Skype. In 2013 he released his first CD "About Time". You are not afraid to make "mistakes"
If you have any questions about your skill level or whether or not you should attend please email Jon and we can discuss your dulcimer and musical experience and figure out what makes sense for both of us. Monday's foundational workshop may run a little longer, after which we'll go directly to dinner (nearby). In Asheville we'll visit the Song of the Wood showroom/store before heading out to dinner. Thursday evening (tenative, for New England only) - Jon Weinberg (and friends) in concert - open to the public - attendees (and a traveling companion) are admitted for free and each Chord Camper is invited to perform a piece if they would like. Friday - have breakfast and check out of the hotel. Our final day of workshops and lunch will end with a mid-afternoon wrap up followed by everyone helping to straighten out the "classroom" space. Afterwards you can depart or join us for a final "cocktail hour" and group dinner. Friday late afternoon and evening you are welcome to stay and work with Jon and others on any pieces you've been working on and want some help and/or feedback, or anything else you have questions about. In previous years, at the request of attendees Jon has given demos on using Band-in-a-Box, and has explained and demonstrated the dulcimer pickups he uses and options. Much of what we do will include exercises to impart skills and build confidence, such as group round-robin accompaniment, and small group and solo breakout sessions where you will arrange a selected tune/song and then perform it before the group. You are encouraged to bring a piece you've been working on but maybe don't feel quite satisfied with, with which you can apply the ideas and techniques you will learn during the week. If you want more ideas and feedback there will be a session where Jon (and other attendees) can work with you to help you develop your arrangement. New England attendees are invited to perform a piece at the Thursday evening concert, either one you've played beforehand or (for the fearless) one you learned and arranged during the camp sessions. Breakfast: is included in the price of your room and provided by the hotel each morning. Lunches: salad and sandwich fixings will be provided for everyone to make their own lunch (included in your registration fee). For a change of pace we may go out for lunch one day. Dinners: For offsite restaurant dinners figure an average of $45 a dinner (including tax, tip, and maybe a drink), or $200-220 for the 4-5 restaurant dinners, a pizza dinner, and maybe a visit or two to local ice cream stands. If you have any dietary preferences or restrictions please indicate this on your registration form. 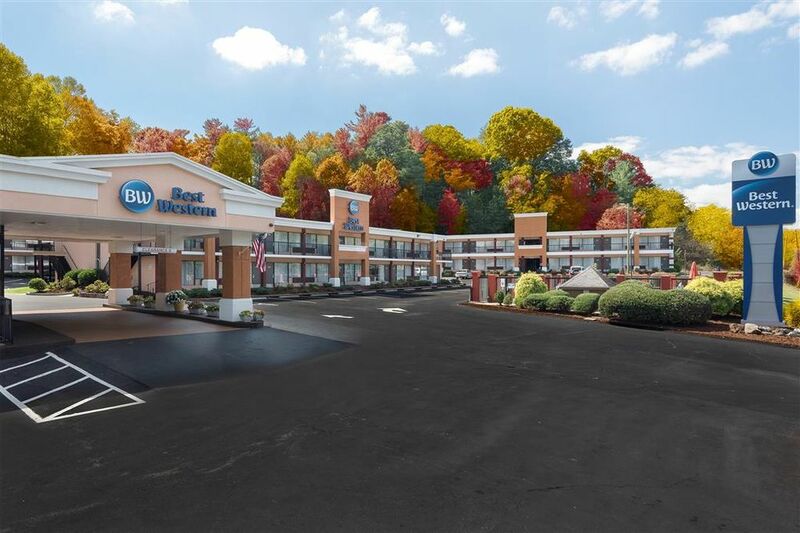 For 2019 we'll either get a block of rooms at a nearby hotel (probably on Tunnel Rd. ), within a few minutes drive to Perelandra, or we'll rent a AirB&B house nearbly (TBD). In the past we've stayed at the Tunnel Road Best Western pictured at the right. 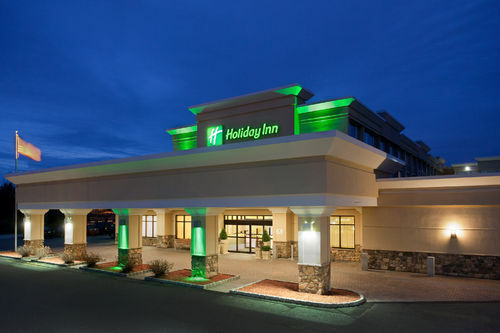 After you enroll, Jon will send you details on how to make your room reservation to receive our special event pricing. Plan on the week (Sunday evening to Friday afternoon) costing approximately $1000 - $1100. This estimate can vary somewhat depending on the cost of your dinner choices, and if you want to share a room with another attendee. At the end of the week most attendees found they'd spent less than was estimated. All workshop materials and expenses including extensive handouts, practice CDs to take home, classroom facility costs, Jon's time and energy, etc. This amount is payable in full when you enroll. Note: Please be aware that TShirts are ordered 6-8 weeks before the beginning of each Chord Camp. People who enroll after that time may not receive one, or at least one in their preferred size (I often order a few extras). Note that enrollments are not being accepted at this time. Please check back periodically for announcements about 2020 dates and enrollment information. If you've never been to the area you might want to spend a weekend before or after Chord Camp to do some sightseeing. 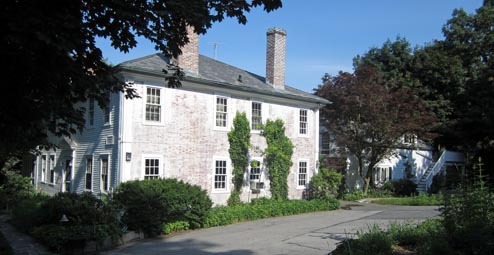 Marlborough is about 30-40 minutes from Boston, Minuteman National Historic Park, and historic Concord and Lexington, MA, and the Wrentham Outlet Mall. There's lots to see and do. You are welcome to bring your spouse or significant other with you to spend the week vacationing here. They are invited to join you/us for all non-teaching activities (cocktail hours, dinners, jams, and offsite activities). 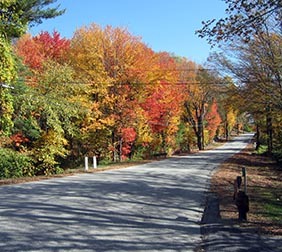 While you are attending workshops they are free to explore Boston and historic eastern Massachusetts, or just relax. Note that they will receive free admission to the Thursday evening New England concert. HD Arranging Camp is a follow-on session for (primarily) alumni of Chord Camp. It came about after several Chord Camp attendees asked Jon to organize and teach more week-long workshops on arranging and performing. It is anticipated that this session will be offered every 2 or 3 years, based on demand, on the week following an Asheville or New England Chord Camp. HD Arranging Camp builds on the use of chord-based arranging learned in Chord Camp and focuses on various additional techniques used to turn both fast and slow tunes into polished performance pieces. The number of attendees will be very limited so that everyone can spend a good amount of time personally working with Jon. Less time will be spent on instruction - the emphasis will be on each attendee personally making, embellishing, and iteratively perfecting arrangements of several assigned or brought pieces. Throughout the week everyone will perform their arrangements for group feedback, and provide constructive feedback to (and get ideas from) other attendees on their performed arrangements. By the end of the week each person should have several polished arrangements to go home with that are ready to perform. Costs: The enrollment fee for this very small-group workshop week is $600. Lodging arrangements, TShirts and lunches (both included in your enrollment fee) and dinner arrangements will be the same as the Chord Camp held the week prior to this session. Email Jon if you have any questions or would like to sign up. NOTE: a minumum number of attendees is needed to offer this workshop. HD Performing Camp is a follow-on session for (primarily) alumni of HD Chord Camp and HD Arranging Camp. It is anticipated that this session will be offered every 2 or 3 years, based on demand, the week following an Asheville or New England Chord Camp, on years that HD Arranging Camp is not offered. As with HD Arranging camp, the number of attendees will be very limited so that Jon can spend a good amount of time with each person. The emphasis will be on each attendee putting together a performance setlist, practicing and perfecting their pieces and stage presence, getting group feedback, and being videotaped so you can see how your arrangements sound and how you come across to an audience. The culmination of the week will be performing your set for one or two live performances in small local venues. For practice each person will perform their arrangements throughout the week before the group for group feedback, and observe and provide constructive feedback to (and get ideas from) other attendees about their performances. Do you know how you come across when performing (your stage presence)? See yourself on video!